As the Chief Customer Officer of Ayasdi, Sangeeta Chakraborty focuses on the design, development and deployment of intelligent applications at some of the world's largest and most complex enterprises. In her work at Ayasdi she worked with Citi on a number of regulatory risk items stemming from Ayasdi’s pioneering work with the bank on CCAR. Additionally, Sangeeta pioneered the development of a Center of Excellence at HSBC to capitalize on the gains made achieved by applying artificial intelligence to the bank’s anti-money laundering efforts. Previously, she served as VP of Professional Services for Accela, the leading provider of cloud-based civic engagement solutions for governments. She built multiple professional services practices across a number of successful startups including Digital Fuel (acquired by VMWare), Inquira (acquired by Oracle) and Interwoven. 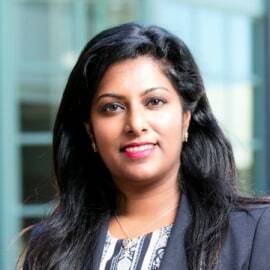 She began her career in consulting with Tata, Fujitsu and Vitria, and earned her BS in Computer Science from the National Institute of Technology in Warangal, India and her MBA from UC Berkeley.